Ayla Nereo is a beacon of light, a modern bard of beauty, a magical creature singing directly from her soul. 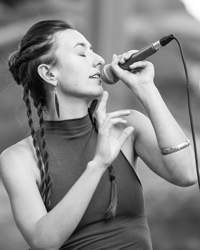 With poetry splashing like dazzling paint across a canvas of sound, Ayla builds layer upon layer of vocal melodies into majestic loop-pedal harmonies, weaving syncopated threads of guitar, kalimba, piano, and percussion into her live performances. Calling us to listen deeper, her songs are elegant masterpieces of lucid storytelling, with lyrics ringing as anthems, riddles, and mantras for hope, healing, and love. With an uncanny ability to disarm and crack open the heart, Ayla sings for the depth of our humanness, for a truth beyond time and place, and for the pure wonder of life itself.